Setting a school record is an exemplary feat for any college athlete. Breaking that very record your next game is practically unheard of… that is, unless you’re St. Scholastica’s William Maupins. The senior point guard banked 15 points, 10 rebounds and 10 assists in a game against University of Wisconsin-Superior this season. It was the first triple-double in school history. Then, the very next game against Augsburg, William topped his previous performance by recording an incredible 19 points, 10 rebounds and 10 assists. The Rosemount native, who also played football and baseball in the early days, began developing these basketball skills — like his favorite moves, the spin and rocker step — at a very young age. William also praises his former coach Tom Stackpool—who he says is ‘like family’—at Mesabi Community College, where William began his collegiate basketball career. Coach Staniger recruited and courted Williams while he played at MCC. Although William refers to his time at MCC as “two wonderful years,” Staniger convinced William there was an immediate place for him on St. Scholastica’s team and that his style of play would fit with their basketball program. Add on Scholastica’s additional draws and William’s decision to transfer made sense. Ever since, he’s been a strong contributor. So far this season he made all-tournament team at the UWS tournament and Nebraska tournament, and was named the Upper Midwest Athletic Conference player of the week twice. 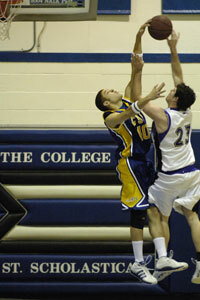 Last year—his first season at St. Scholastica—he was named first team all-conference and first team all-defensive. “He has a great feel for the game. 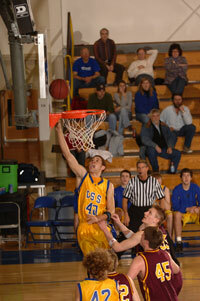 He’s a very smart basketball player,” Staniger says. These smarts seem to transfer to the classroom as well, which William takes very seriously. William’s contributed to the University newspaper, is part of the intercultural club and will graduate this spring with a Communication degree, although he has yet to decide exactly what career avenue he’ll pursue. William’s also considering advertising and marketing, or even pursuing an acting degree—he’s hoping to audition for the University’s spring play if he can find the time. Basketball comes first though, as it has for years. This ‘super senior’ is facing his last collegiate season with very high hopes. If William has anything to say about it—and no doubt he will, with a few more record-reaching performances—this goal has a valid chance of becoming a reality.